It has taken over a year…a YEAR!…but I finally have it done (unless you count the cape I hope to make for it by next Saturday). I’m not madly in love with it. The black is light sucking. I did so much by the seat of my pants that I have no idea if any of it is actually plausible. I had to totally alter the sleeves from the original pattern because finishing it in fall means shorter sleeves will be impractical. And the whole up sizing of that pattern was a challenge (aka a drag). But, it is done. It is wearable. My next goal is the cape to keep me from freezing to death next weekend. I wish I had some black wool. Alas, I do not. And I have mountains of black material in my stash to use. 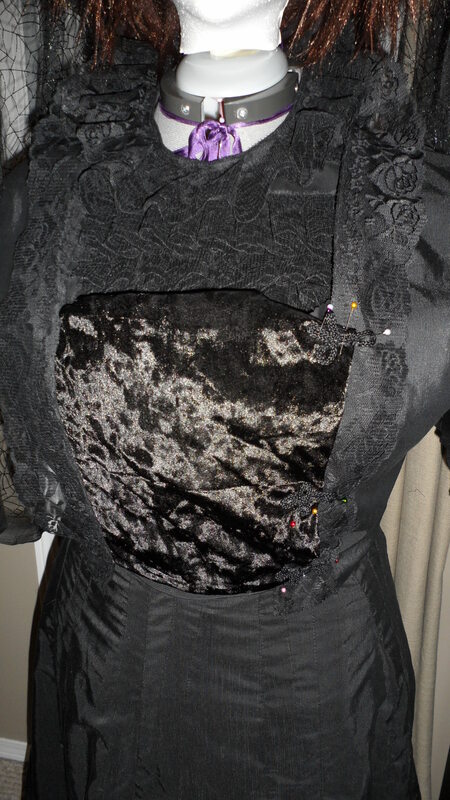 I’ve made some headway on my mourning gown. But, I did have to re-cut and sew a new front flap panel. It fit with some squishing but I decided that in 1900 they were starting to move towards the pigeon front and not the snug fit of the earlier years. This required a piece that was 3″ wider. Thank heavens, I had enough fabric to re-cut it! I realize that the remodeled panel looks crooked on the top. It isn’t in reality. Once it is really buttoned down (I will be using the Chinese frogs I made for the Oriental challenge of Historical sew fortnightly) and the faux shirt is laying flat, it will be fine. I’m on the edge with the faux shirt. It seems a bit like over kill. But, since it is just a bib like thing, I could find a fabric I like better and make another one. 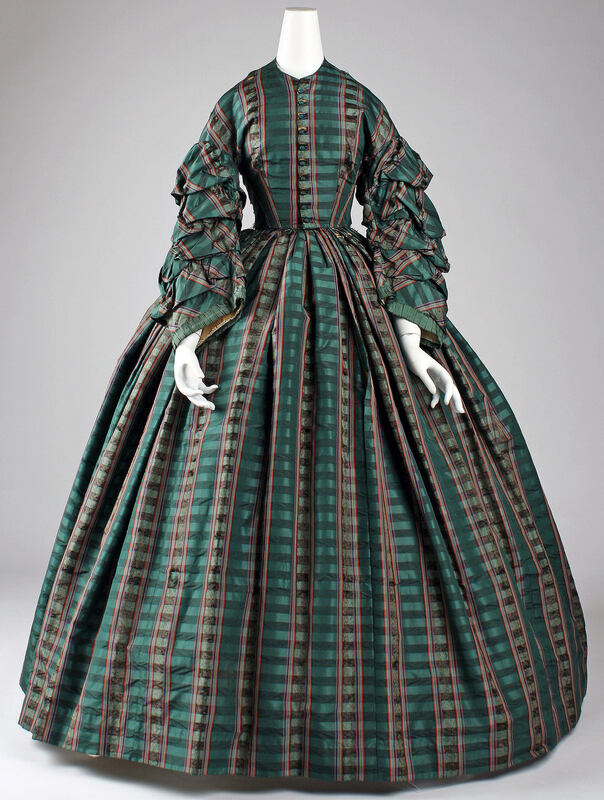 This one will do fine for the more Halloween version of this dress’ incarnation. The one thing I do like about it, is it adds some more curve that would help with the pigeon front look. I just don’t know…. Once the sleeves are on and the fasteners are on and functioning, I should be able to make a better decision on the shirt front. If all goes well, I should have the bodice done on time for my event next weekend. It is an evening event and our evenings are getting decidedly cold. I’ll need some sort of item for warmth. I had thought of dying one of my knitted shawls black but the dye pack I was looking at, could not promise that it would dye black and not some dreary shade of grey. So now I’m hoping to get a cape made by next weekend. My oh my, being employed is getting in the way of my sewing plans! 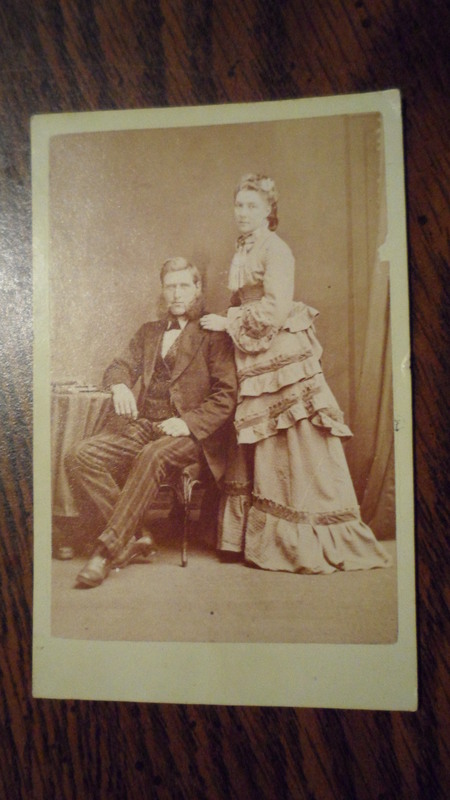 Today I have a carte de visite from my collection. At first glance you notice the dress. 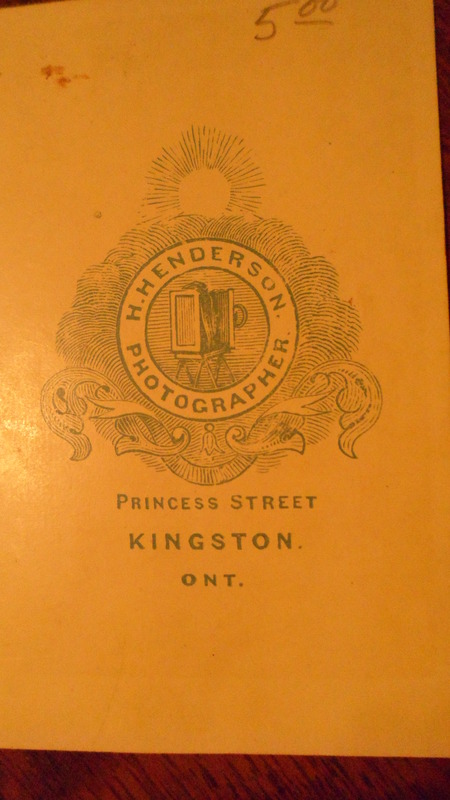 My guess it is from the 1870’s. At least the silhouette seems to be 1870’s to me. I like that it is a paler color than many of the other photographs I have. I also notice the flower in her hair. I wonder if this is a wedding photo? 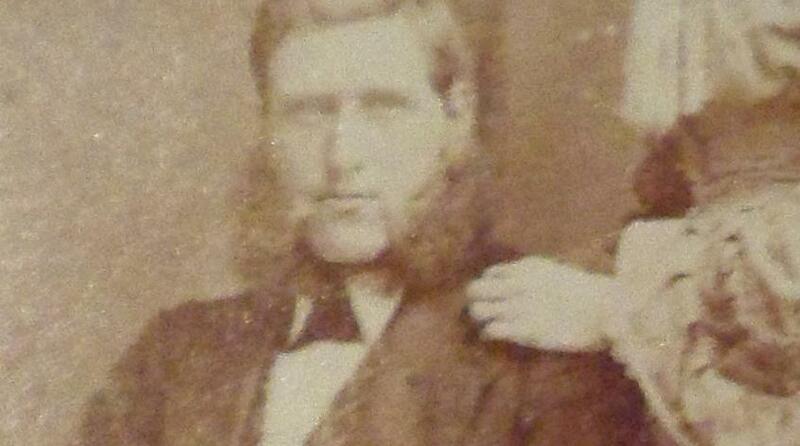 Upon my second glance of the photo, I noticed that this fellow has some serious sideburns! I believe the term for these bad boys is mutton chops! Zooming in on these photos bring in surprising details. 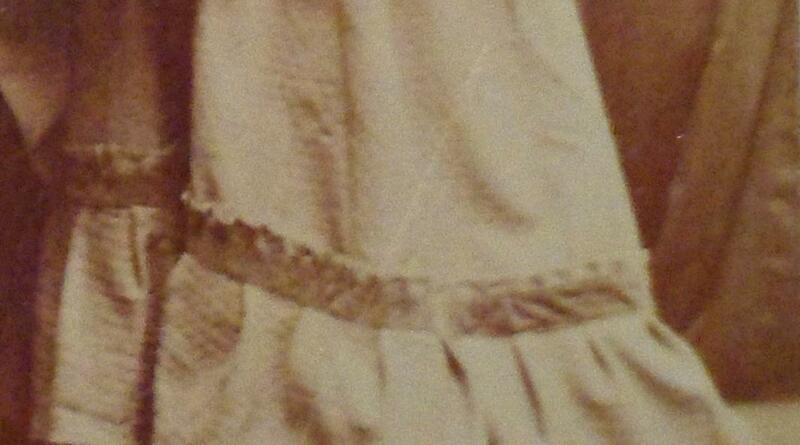 When I zoomed in on the dress, I discovered that the fabric has some sort of texture to it. It makes me think of waffles. Why are my dreams bigger than my purse? I’m dreaming of one day building something like this…. 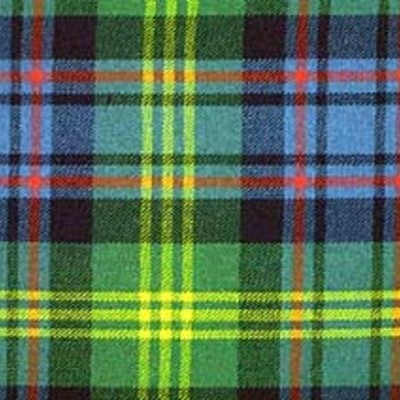 I don’t know if I love it because of the color or the plaid or the shape but I love it. 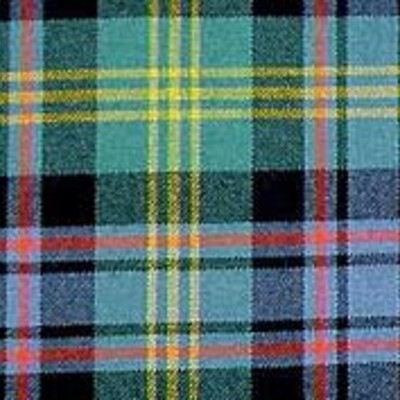 And I want to do it in my family tartan…Watson. Either this one…. I think I’d need at least 10 meters to pull it off. At $60-70. A $700 dress. A $700 costume. Sigh. Ain’t gonna happen unless I can find a winning lotto or a cheaper source. I don’t think I like this! 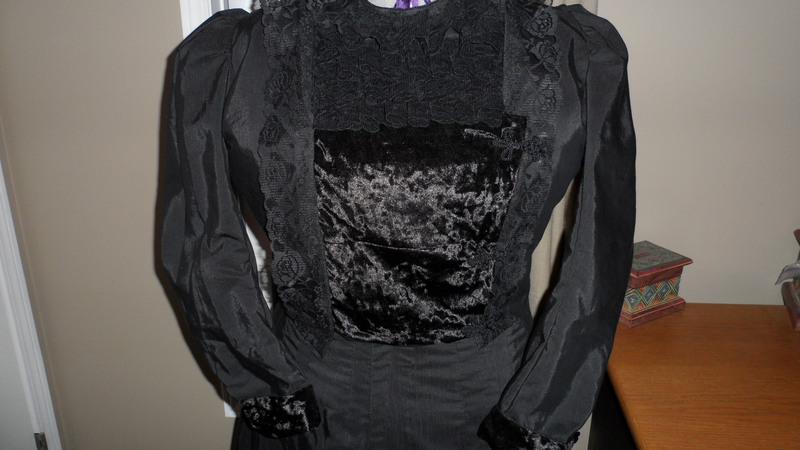 I’ve been working on my bodice for my 1900 widows weeds. This is my inspiration. I got it from a book I borrowed from the library. It has the pattern pieces that you have to enlarge. It has been difficult. I haven’t got this enlarging thing mastered. The pieces were either to big or to small. They also lacked in instructions on how to put the thing together. So I’m now flying by the seat of my pants…almost more of a draping exercise than an enlarging original patterns exercise. We will see how far we get tomorrow. I’ve learned a lot from the experience. The first is that corset making isn’t that bad! The second is that if I use a thinner fashion fabric, I should use a thicker inter-liner (too many wrinkles). 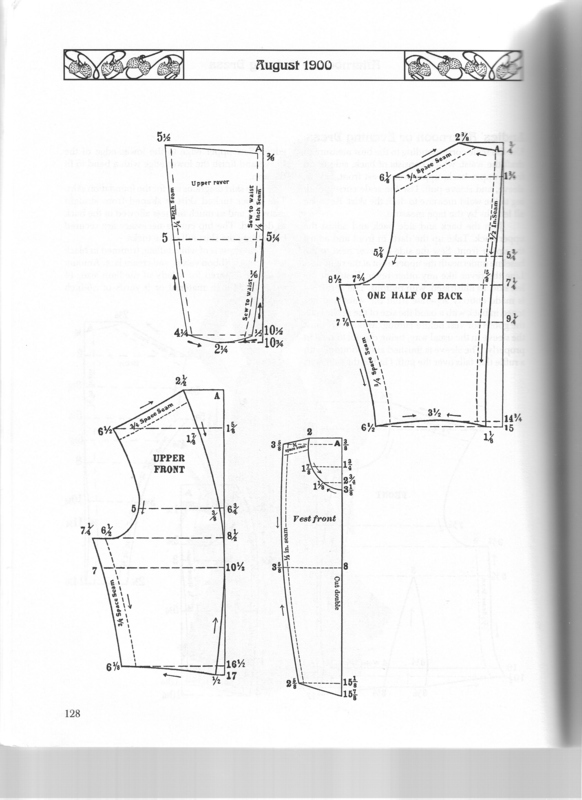 And finally, if I am going to trace the pattern pieces off of an existing garment, I need to go back and compare the pieces to the garment with a tape measure. My tracing and eyeballing during assembly didn’t work out. I originally thought it was an inch bigger than my original, (which is what I was going for) but it is much bigger…in fact, some how, it is the same size as the one I tore apart which was an inch to big! But it is still usable. 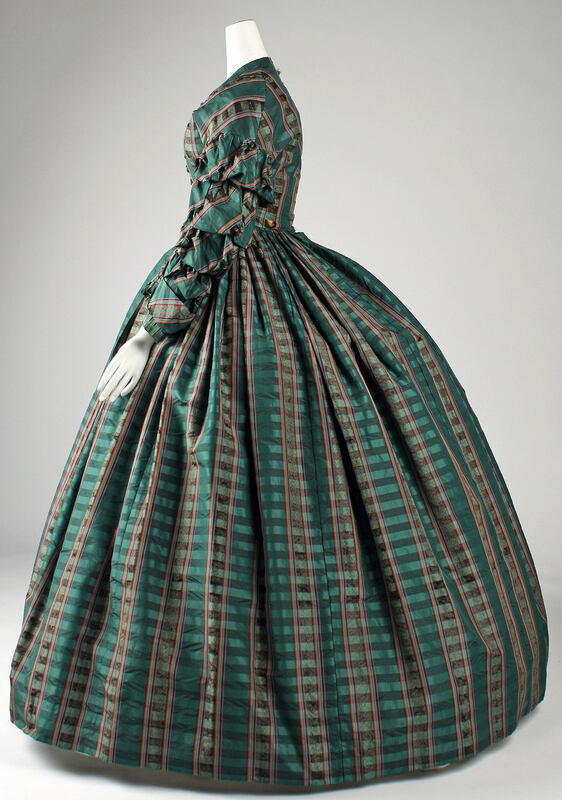 It will work with my swimsuit and my tea gown (which I will alter soon). 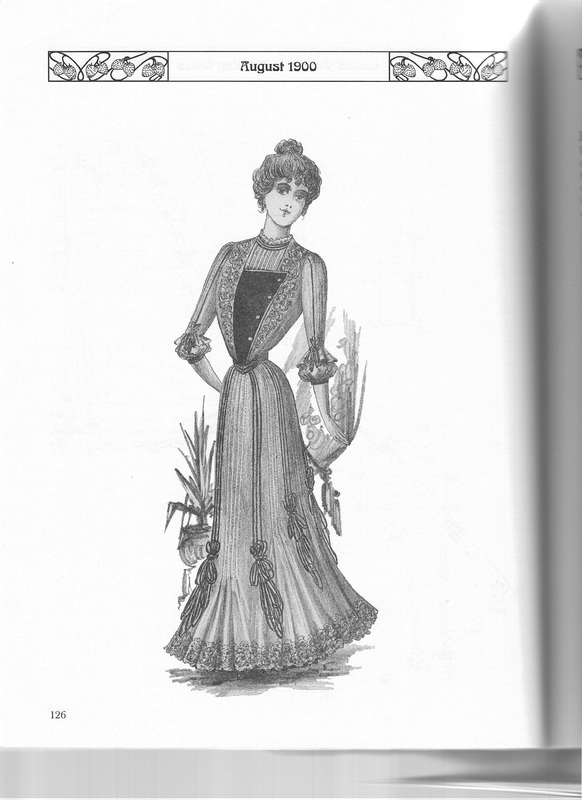 Some women did wear corsets with those garments, but they would have been looser. Being cotton, they will be cooler as well and for lounging outfits like a swim suit and tea gown, cool is better. 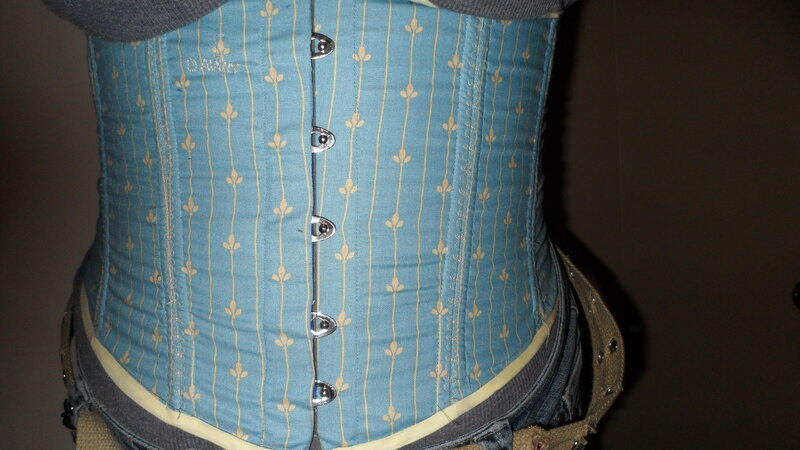 I do wear a corset almost daily to deal with back pain. If I am on my feet a lot, I need a corset that is tighter than this one goes but if it is a sit a bit, stand a bit kinda day this one will work as well. So, not a raging success but better than I was expecting! I have the confidence now to say ordering more hardware for another one will not be throwing my money away! That wont happen this calendar year, but perhaps next year. How historically accurate is it? : The fabric is plausible. I doubt they machine sewed everything. The bones are metal not baleen. 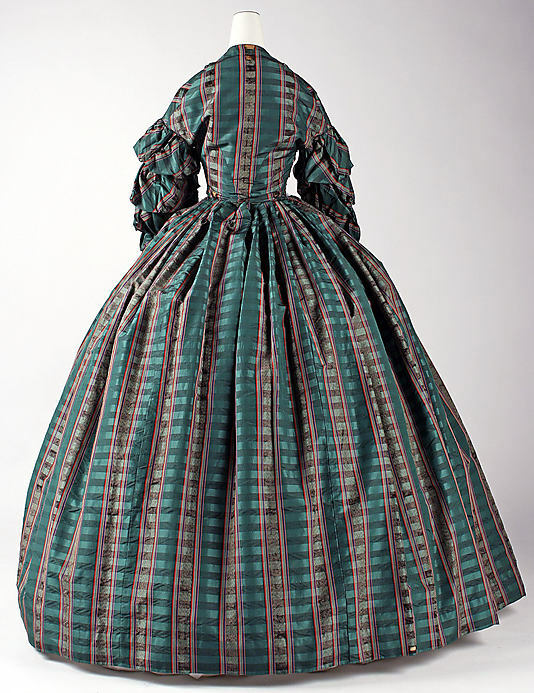 I can’t be sure that the original modern corset is based on anything historical. I wonder how many women would have made their own corset? Is it like the modern bra where even the poorest of women bought pre-made and some could afford tailored? So 30%?